Gaddafi announced a war against imperialism in the first address he has given to his supporters in days, all while coalition forces continue air-strikes on Libya for the fourth consecutive night and NATO warships started patrolling Libya’s shores. Libyan TV broadcast what it called a live address by the country’s leader to his supporters from Muammar Gaddafi’s compound in Bab al-Azizia not far from the Libyan capital of Tripoli on Tuesday night. The compound was hit on Monday by air strikes from allied forces. 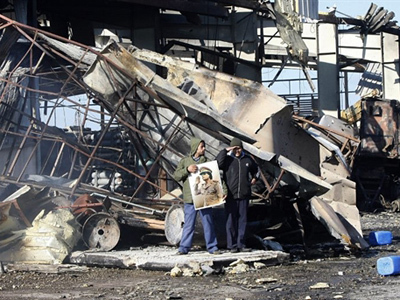 Gaddafi denounced the coalition’s strikes on his troops, calling it "unjustified aggression". "We are leading the revolution," he said. "We are leading the global revolution against imperialism." "We'll be victorious in this historic battle, we won't surrender," he concluded. Gaddafi promised to make a “mockery” of the coalition rockets and threatened that he had not yet used the full might of his military machine. It was Gaddafi’s first public appearance in a week. After the coalition forces started ensuring a no-fly zone over Libya on Saturday, no stray aircraft have entered the country’s airspace. On Wednesday three explosions were heard just before dawn in the capital Tripoli, where the residence of Gaddafi was once again attacked. Attacks have also targeted military bases in the cities of Tajura and Jafar, the first located 32 kilometers east of the capital. There are reports of fires at the base and of civilian deaths in Tajura, as bombs destroyed residential blocks near the military base. On Wednesday Britain claimed to have virtually eliminated the Libyan Air Force.The air defense system of Libya has also been practically wiped out. On Tuesday, coalition pilots carried out over 300 missions, with the US military reporting over 100 air strikes. 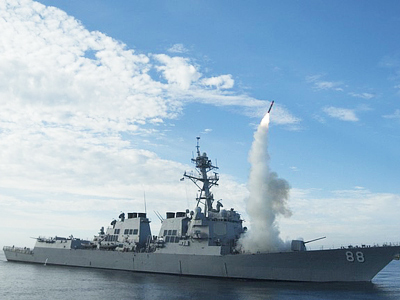 Since Operation Odyssey Dawn began, the international coalition has fired 160 cruise missiles at military targets in Libya. The no-fly zone has not stemmed the advancement of Gaddafi’s ground forces. 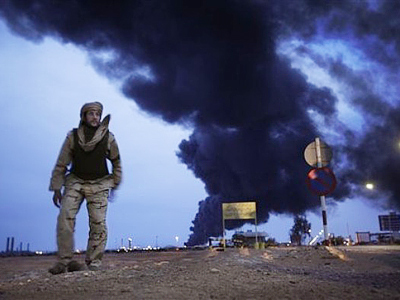 The cities of Misrata, Az Zintan and Ajdabiya among other locations are still under siege by pro-Gaddafi troops and suffer worst. 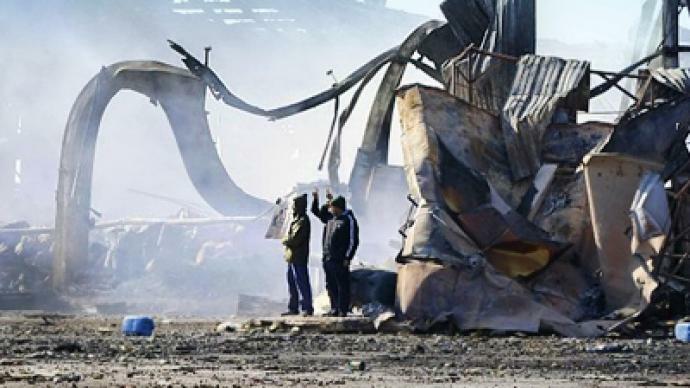 In Misrata, a city 200km east of Tripoli, 17 civilians were killed on Tuesday, four of them children, as a result of the advance of Gaddafi’s forces. This brings the death toll in the city to ninety in the past five days. Gaddafi’s soldiers are reported to have taken sniper positions on roofs, shooting at everything moving on the ground. The local hospital is said to have run out of medicine and is turning people away. 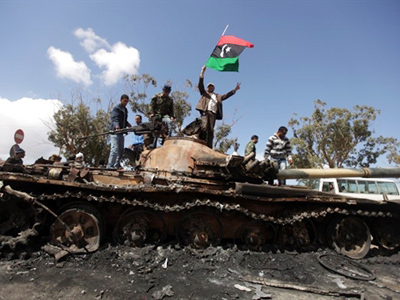 The rebels have failed to advance beyond the town of Benghazi, their major stronghold, as their weapons do not compare to those of Gaddafi’s troops. The rebels also lack crucial command and rank structure. The absence of leadership could mean that nobody will be able to take over Gaddafi’s post should he be forced to step down. The West’s involvement in the Libyan crisis seems have backfired on the coalition, as more and more Libyans criticize the international community for interfering in Libya’s internal affairs, dubbing the West ‘aggressors’. Air strikes which have lead to multiple injuries among Libyan villagers are bringing many civilians closer to Gaddafi. Lindsey German from the London-based Stop the War Coalition believes that the interests being pursued by the West pursued in Libya have little (nothing) to do with protecting civilians.